The SpringSource dm Server™ is a completely modular, OSGi-based Java server designed to run enterprise Java applications and Spring-powered applications with a new degree of flexibility and reliability. The SpringSource dm Server is based on the new SpringSource Dynamic Module Kernel™ (dm Kernel). The dm Kernel provides a module-based backbone for the server, which also harnesses the power of Spring, Apache Tomcat, and OSGi—based technologies. 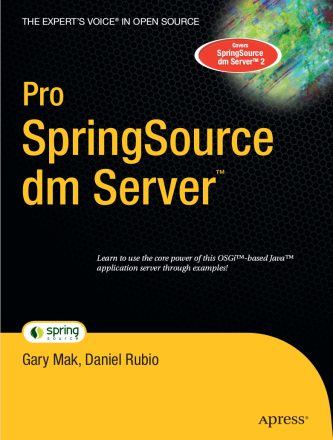 Pro SpringSource dm Server™ is the first book available for learning how to develop and deploy modular applications to run on the new SpringSource dm Server 2.0 deployment platform, just released. This book covers everything you need from basic OSGi concepts to developing and deploying OSGi-based applications on the SpringSource dm Server. This book demonstrates how to migrate an existing web application from a standard WAR to a shared libraries WAR, a shared services WAR, and finally a web module. The topics in this book are introduced by complete and real–world examples that you can follow step by step. Instead of abstract descriptions on complex concepts, you will find live examples in this book. This book is for Java developers and deployers who would like to develop modular Java applications using OSGi and deploy them to run on the SpringSource dm Server. You don’t need much experience to read this book. However, it assumes that you understand Spring Framework fundamentals and have experience developing Java applications.